Speaking at a press conference on Thursday afternoon, Al-Nassr winger Ahmed Musa is confident that the Super Eagles will do better than they performed at the 2018 World Cup. 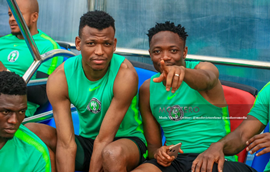 Musa, who is expected to lead the Super Eagles players onto the Stephen Keshi Stadium turf today vs Seychelles, reckons that the young players in the team have got what it takes to succeed at the upcoming tournament in Egypt, having featured at the World Cup. ''We have been together for quite some time, coming back from the World Cup with all the AFCONQ games and we have not lost any game,'' said Musa to reporters. ''For me I have that confidence that we have a very good team because we know each other for so long, so we are just waiting for the tournament to start. ''Right now we have that experience that we have been to the World Cup, we have that experience with some of the new players. Of the twenty-three players named to the Super Eagles roster for the AFCONQ vs Seychelles, fourteen traveled with the national team to Russia for the 2018 World Cup.